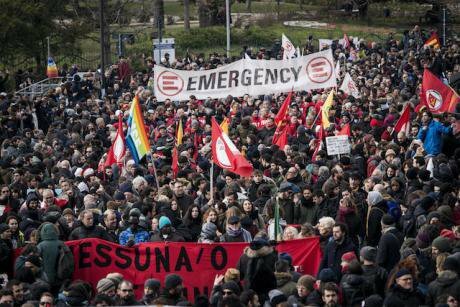 February 10, 2018: Thousands of people protest against racism and fascism during a national demonstration in Macerata, Italy. Danilo Balducci/Press Assocation. All rights reservedLast Saturday in the centre of the Italian city of Macerata, a young man affiliated with the extreme-right opened fire on Gideon Azeke, Jennifer Otiotio, Mahmadou Touré, Wilson Kofi, Festus Omagbon and Omar Fadera. They were singled out because of the colour of their skin and their African origins. Several days prior to the attack, several suitcases had been found in Macerata containing the mutilated body of a young female drug addict, Pamela Mastropietro. The principal suspects of the grisly murder at present are two Nigerian drug dealers. The gunman who perpetrated Saturday’s attacks said in his confession that he’d gone out hunting black people to avenge the young girl’s death, and with the intention of killing every immigrant selling drugs. The media were quick to portray the attacks as the acts of a mentally unstable individual or as crimes of passion, but the environment in which the attacks occurred weakens the case for either of these explanations. On the contrary, rather than avenging the young woman’s murder, the gunman sought to send a clear message to his compatriots: immigration is a threat to all of us, particularly for the most vulnerable members of society. 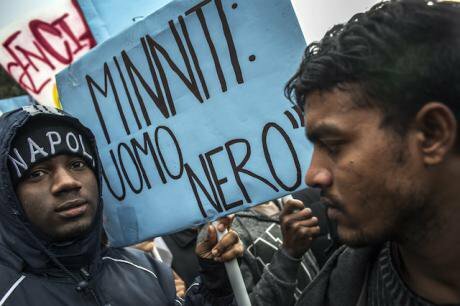 Our response must be to call things by their right names: what happened in Macerata was an act of fascist terrorism, the most serious attack of its kind since Italy’s “Years of Lead.” This act was intended not only to sow terror among people of colour living in Italy, but also to play on the pervasive fears that haunt Italian political opinion concerning immigration. Furthermore, beyond matters of political opinion or party affiliation, the theatricality of the attacker’s surrender to the police displayed precisely those elements constituting the essence of an underlying fascist ideology: that is to say, fascism as an obscene death cult. Why then do Italy’s political leaders seem unwilling to recognise these facts? The “immigration as a social problem” trope has become an established fact across the political spectrum, with the result that the divide between different political options has shifted from the question of the problem itself to that of its possible solutions. Therefore, the various political actors, while not necessarily engaged in “race-thinking” themselves, have come to adhere to a single discursive framework in which immigration policy becomes the fundamental problem. It does not matter how much effort is put into statistical evidence proving the falsity of the idea that “native Europeans” are being invaded and replaced by African migrants. As Hannah Arendt reminds us, an ideology is not a theoretical doctrine, but an arm of mass persuasion appealing to the “immediate political necessities” of men and women, in other words to their lived experience and desires. 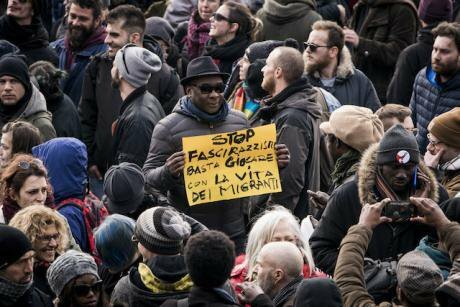 February 10, 2018: Thousands of people protest against racism and fascism during a national demonstration in Macerata, Italy. NurPhoto/Press Association. All rights reserved.There is no point in calling for thoughtful reflection and silence, as did the mayor of Macerata, when, fearing further division and violence, he called for the cancelation of an antiracist and antifascist rally organised for February 10 in his home town. Rather than appeasing tensions, the silence the mayor calls for runs the risk of leaving an open space for the voices of those who sow hatred, because at the moment, it is those voices who occupy the foreground of public debate. It is for this reason that the struggle against the sort of barbarity we have seen in Macerata calls not for silence, but for powerful symbols. We must counter the pseudo-heroic acts of the fascist gunman with thousands of daily acts of resistance. We must counter the fascist death cult with the phrase used in the Zapatista communities of Chiapas to welcome visitors who come as friends: “Long live Life, down with Death!” With this in mind, we of DiEM25 Paris and DiEM25 France welcome the success of last Saturday’s rally, which, despite all opposition, drew thousands of committed citizens to Macerata and sparked solidarity demonstrations all over the world. We invite all who want to stop the race to barbarism on our continent to seize any occasion to speak up against racism and fascism, in a spirit of solidarity and constructive disobedience. Viva la vida y muera la muerte! Anti-fascist demonstration in Macerata on February 10, 2019 in response to the assault on immigrants by extremist Luca Traini. NurPhoto/Press Association. All rights reserved.